A key handwritten scientific document by Alan Turing, in which he works on the foundations of mathematical notation and computer science, is to be sold in the Fine Books & Manuscripts sale at Bonhams New York on 13 April. The manuscript is expected to sell for at least seven figures and a portion of the proceeds from Bonhams and the vendor will be donated to charity. 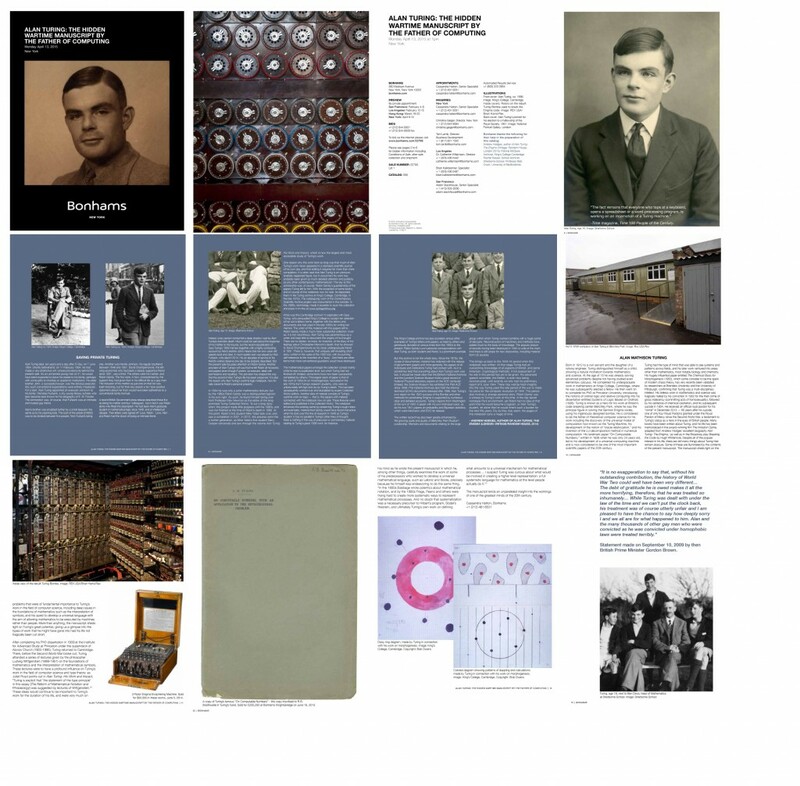 Made up of 56 pages contained in a simple notebook bought from a stationers in Cambridge, UK, it is almost certainly the only extensive autograph manuscript by Turing in existence, and has never been seen in public. From internal evidence, it dates from 1942 when he was working at Bletchley Park to break the German Enigma Code, and provides remarkable insight into the thought process of a genius. As he writes in his distinctive hand: ‘The Leibniz notation dx/dy I find extremely difficult to understand in spite of it having been the one I understood the best once! It certainly implies that some relation between x and y has been laid down eg, y=x2+3x…’ It was among the papers left by Turing in his will to his close friend and fellow mathematician, Robin Gandy. Turing committed suicide in 1954 as a consequence of the hormone treatment to ‘cure’ his homosexuality which he was undergoing as an alternative to imprisonment. Prior to its sale, the manuscript will be on tour by private appointment in San Francisco (February 4-9), Los Angeles (February 12-15), Hong Kong (March 19-22), and New York (April 9-13). More details here. Below are some images from the sale catalog. 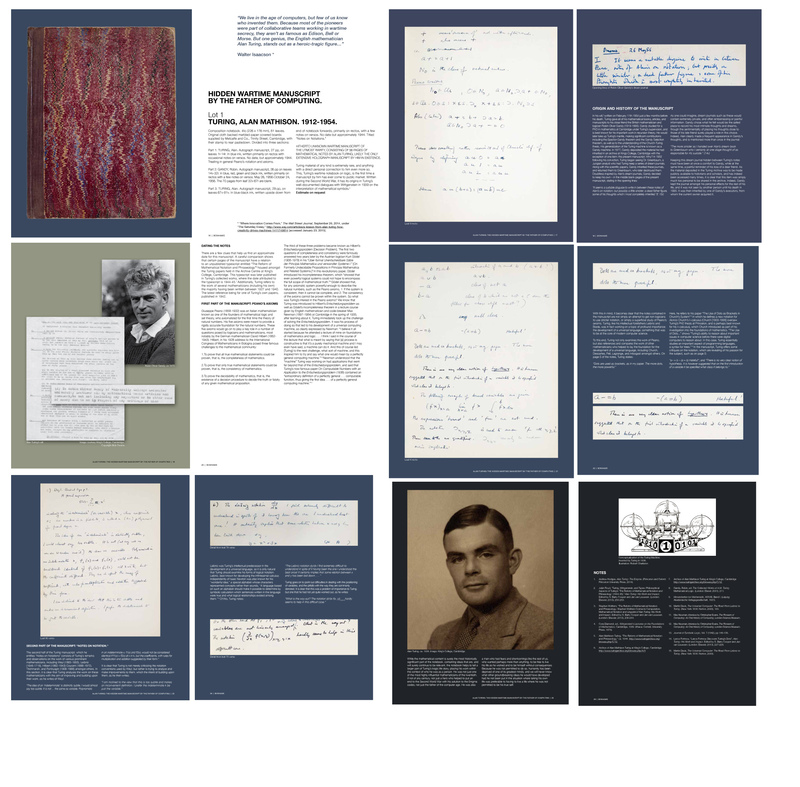 UPDATE (2/10/14): Richard Zach discusses the manuscript and links to a full-sized version of the catalog over at LogBlog.